Research indicates that Roman roads ran from Gloucester to Aqua Sulis (Bath) and from Corinium (Cirencester) to Arlingham, the latter on the Severn and a probable crossing point – by ford or ferry – for the Romans to their sever- al fortress towns in South Wales. The point at which these roads intersect is the small Gloucestershire village of Frocester and it was there – a short drive from Wotton-under-Edge - that members of the History Society gath- ered on an unseasonably sunny December morning in 2009. The object of our visit was to see and learn about the 14th century barn that still stands and, amazingly, is still fully utilized, within the grounds of Frocester Court. But the splendid old barn is just a small part of this fascinating area that dates back to the Bronze and Iron Age periods. A Roman Villa has been excavated in the vicinity and, in the courtyard of that building, items discovered such as bracelets, tools and, believe it or not, eyebrow tweezers. The Romans led a very sophisticated lifestyle and an article on their habitation of Gloucester will feature in a future copy of your Journal. But to return to the estate Barn. The building is some 700 years old and extends 186 feet in length, 30 in width, 12 to the eaves and 36 feet to the ridge. The interior, with its massive oak roof, is divided into 13 bays with two wagon bays at the southern end. The walls, built of local Limestone, are heavily buttressed and the roof a mixture of Cotswold and red sandstone tiles. 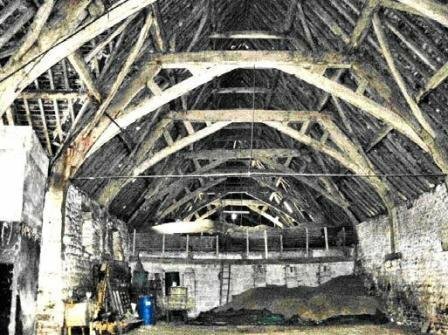 Much has had to be done in res- toration work over many years but the barn remains substantially as it was originally built, and this despite a fierce fire in the early part of the sixteenth century. The flagstones and cobbled stones which comprised the original floor have been replaced by compacted clay and gravel. A rare Whitlaw and Sturritt water turbine is still in its pit below the floor and was used in the mid-19th century for processing, and eventual grain storage. Such is the old Barn. The remainder of the 303 acre farm estate com- prises a fine Cotswold stone homestead built around the remains of a mid-15th century Court House; an imposing Gatehouse dating back to the 16th century with a decorative addition, supposedly built to commemorate the visit of Queen Elizabeth I in 1574. This latter building underwent extensive restoration during the last century. The whole estate dates back to the 9th century when, as a 2000 acre medieval manor, demesne farm and adminis- trative centre the land was granted by the brother of the king of Mercia to the monks of St. Peter’s Abbey in Gloucester. Perhaps Frocester Court is a little beyond the bounds of Wotton-under- Edge, but it is but a short car journey and those of our members who set out that cold but sunny December day were well rewarded by an informa- tive and vastly interesting commentary and, for some, a superb lunch in the nearby 18th century George Inn. We are indebted to Mrs. Dawn Waring for the superb photographs of the Court and Barn.